The Wyoming State Geological Survey (WSGS) has published three new geologic maps under its StateMap program. These maps are based on extensive fieldwork and focused on the geology related to energy resources and geologic hazards in Wyoming. The “Eastern Great Divide Basin” project involved geologic mapping, as well as assessing potential oil, gas, and coal resources in the region. This project resulted in two geologic maps (1:24,000 scale), both in Carbon County: Rawlins Peak SW (southwest) quadrangle (Open File Report 15-06, Principal Investigator Christopher Carroll); and Shamrock Hills quadrangle (Open File Report 15-07, Principal Investigator Ranie Lynds). “Our goal for the Great Divide Basin project was to produce large-scale bedrock maps that can be used for better characterizing and assessing subsurface energy resources such as oil, gas, and coal,” says Seth Wittke, WSGS manager. Also published for this project is a report written by Carroll, Lynds, and others, which includes geologic descriptions, geologic settings, and analyses of the samples collected in the field (Open File Report 15-08). 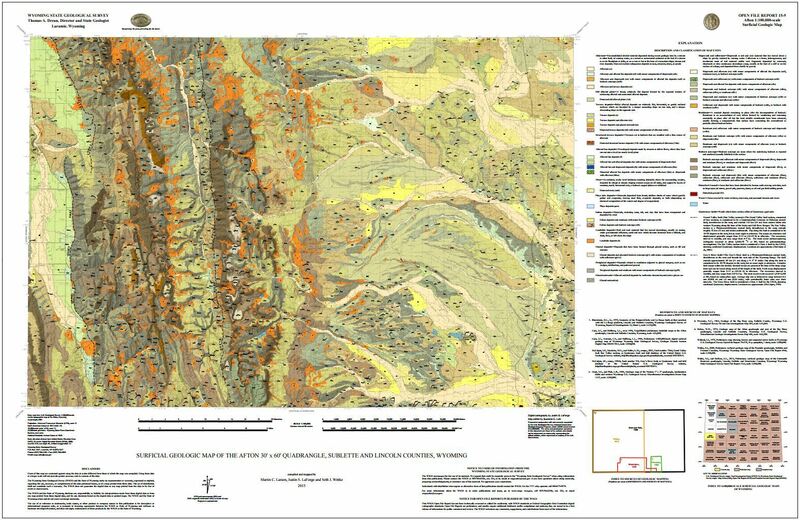 An additional StateMap project involved a geologic hazards assessment and production of a surficial geology map of the Afton quadrangle” (30’ x 60’) in Lincoln and Sublette counties (Open File Report 15-09, Principal Investigator Martin Larsen). “This map can be used to better identify Quaternary fault scarps in the area,” says Wittke, who coordinates the StateMap program. Quaternary faults are those that have moved within the last 2.6 million years. “Geologic maps provide a tool for accessing where the faults are and how the fault characteristics can affect the geologic hazard they pose,” Wittke added. “The Afton map can also be used for unconfined aquifer modeling, as well as to identify areas for mining aggregates,” Wittke said. During the completion of this surficial map, geologists identified 15 previously unmapped landslides in the area. These slides will be added to the WSGS landslide database. StateMap projects can also lead to geologists obtaining information for other areas of research by the agency. For example, the Rawlins Peak SW quadrangle map and study also resulted in the measurement of stratigraphic sections for coal. This in turn provided data that will be used in the agency’s subsurface models for overall locations of coal in Wyoming. WSGS received funding for the StateMap projects through the U.S. National Cooperative Geologic Mapping Program, managed by the U.S. Geological Survey (USGS). Each year, the WSGS submits applications for the federal grant to fund specific mapping projects in Wyoming. Projects are proposed to the USGS based on agency research priorities. StateMap projects involve geologists conducting extensive fieldwork in a specific research area. “This year's projects resulted in more than 80 days in the field and nearly 3,000 total hours, from start to completion with the final published maps,” Wittke says. Geologists studied and recorded the location, age, and identified the geology of the selected areas, as well as the orientation and position of the geologic structures. This information was then compiled in a Geographic Information System (GIS) that combines a digital map of the region and data from the field. The final process involved layout and design efforts conducted by a WSGS team of geologists. Then the draft maps underwent internal peer review, with editing by Suzanne Luhr, WSGS map editor. The WSGS also recently published a surficial map of the Red Desert Basin in southwestern Wyoming. This project is under the agency’s Legacy Map program, which involves the release of maps and research not previously published. You are subscribed to All News Releases for Wyoming State Geological Survey. This information has recently been updated, and is now available.